4/4/2015, EDIT: This thread has turned into some weird hybrid of a WIP and a 'let's see where I went wrong' thing. I've requested a name change to better reflect that. 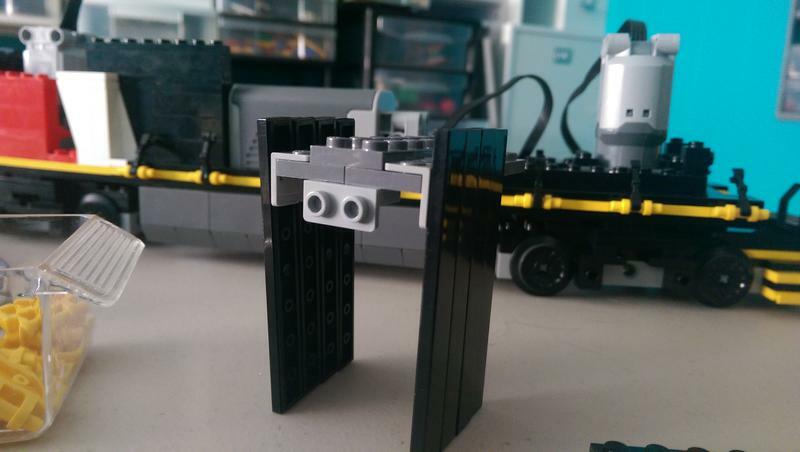 This is what happened when I tried to combine the styling of a 7-wide model from legoman666 ( http://www.eurobrick...howtopic=102535 ) and the mechanics/internal design of an 8-wide model from Commander Wolf ( http://www.eurobrick...howtopic=106654 ). Kudos to both of them for being willing to answer questions via PM, by the way! So, what went wrong? It turns out that you actually need to plan things if you want to do a 7-wide, because there's no good way to try and cram a what I assumed to be 6-wide internal structure into a 7-wide and have anything actually work out right. OH WELL. Could I save this? Maaaaybe, if I was willing to spend way more time than I have on it. Am I going to? Nope. The internal drive system consists of a AA battery box mounted vertically, with two L-motors driving a single four-axle truck each. 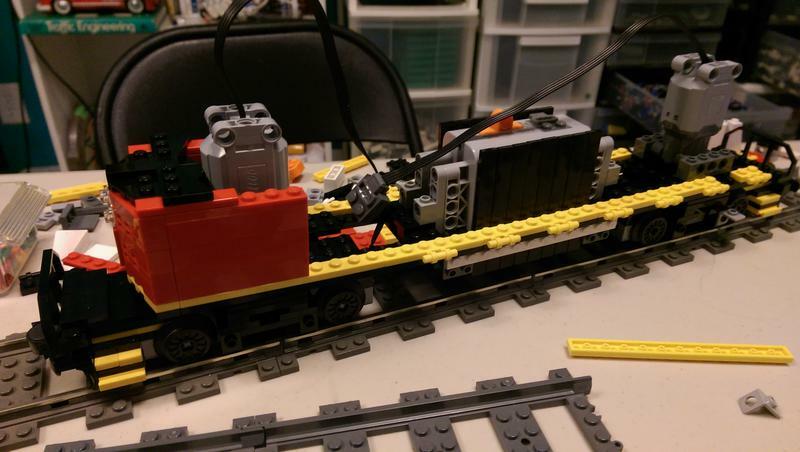 There's a PF switch crammed in there as an extension lead/motor reversing switch, because I didn't realize until now that the trucks worked against each other if they got turned around by accident. Each drivetrain consists of a 20t bevel driving a 12t bevel, which then drives a series of 12t bevels to bring the power down into the trucks, giving a ratio of 3:5 for in-to-out. If I could somehow lop off everything behind the end of the 6x12 panel and still keep the fancy drivetrain, I'd be happy with the proportions; doesn't look like that's possible, so I'll be moving to a more traditional vertically-mounted motor setup without the extra gears. Maybe losing the extra gears will balance out in that I won't be losing nearly as much power to those gears, so the pulling power and speed will be somewhat similar? 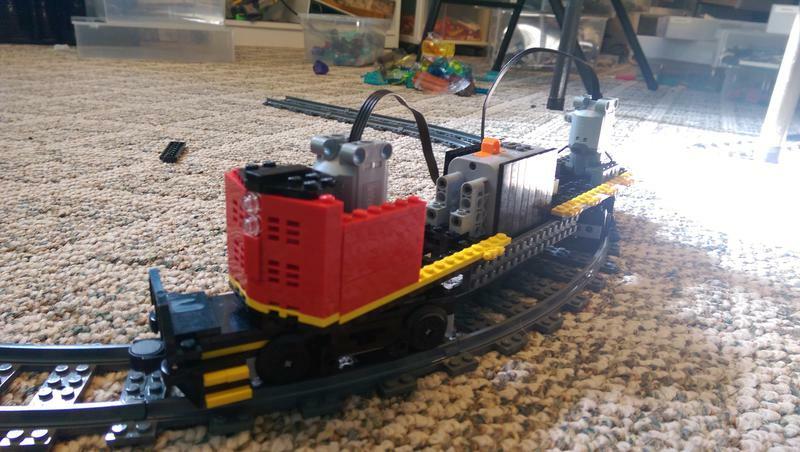 On my relatively small test loop, it'll pull five of the six Horizon Express cars (the sixth is the one with the motor and no battery, left out because I already have this engine to test with) plus the two container cars from the Maersk at a reasonable speed. Wheel slippage is definitely a problem, though I suspect it's because all the weight is in the center from the battery box and lack of body structure. The final revision I was envisioning before going to scrap the model would have ended up with the large plates on the side acting as a monocoque skin holding everything together. If there was one single thing that my nephew's Panda would have you know it's that he has a bowtie. If there's one thing that I would have you know it's that even in the face of spectacular failure, people will assume that you are successful if you have the right bowtie on. 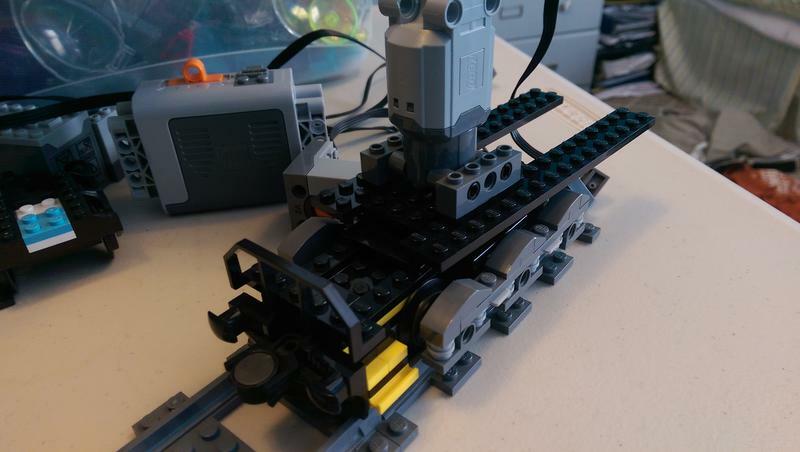 If there's another thing that I would have you know its that the only way that I ever want to learn with lego it's by messing around with the actual pieces and sometimes failing to accomplish something when you thought it through well in your head. I don't like plotting on paper. You touch the pieces find out what works and what doesn't. Sometimes you discover nothing yet learn something that can be applied to a completely different build. They say in hockey and in golf that you miss 100% of the shots that you don't take in sport and in life. I'll choose to mock and poke fun at the guy or girl who argues that this is impossible yet hasn't tried to make it happen, not the person who took a chance and didn't get the desired result. Your creation looks cool, and I'm not at all saying that out of charity. 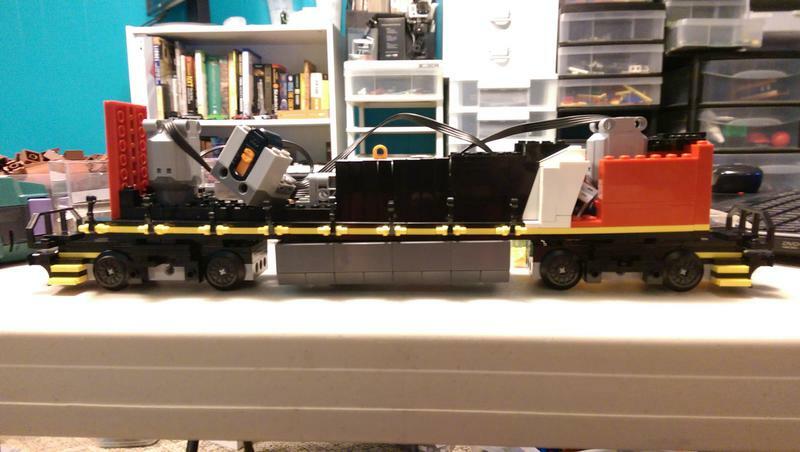 This is actually one of maybe two parts that I'll recycle; it's a successful hybridization of Commander Wolf's wheelset for their model and the truck decorations from legoman666's models. I have no problems with it! 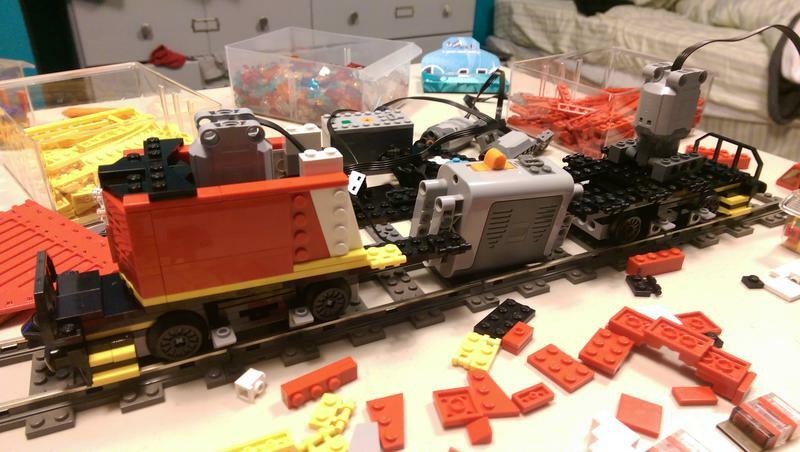 With that lovely running gear that you have built, I think I would just rebuild that cab in the form of an 8 wide locomotive. 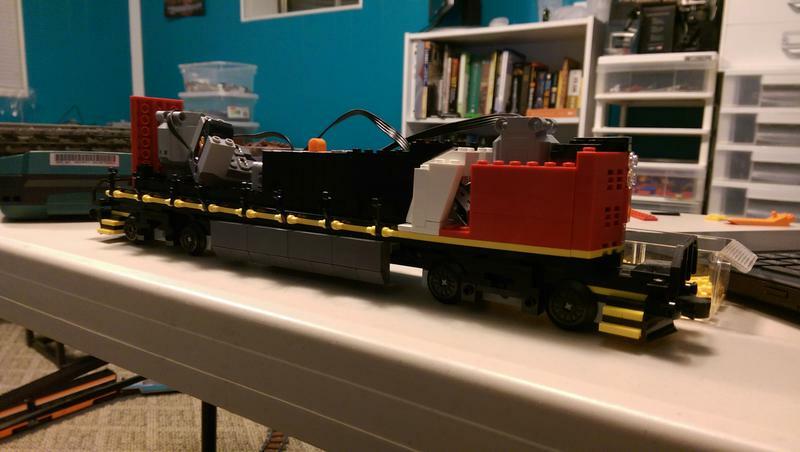 You could convert it to the EMD F45 or maybe an Amtrak SDP40F. Aww, sorry to hear that it didn't work out! 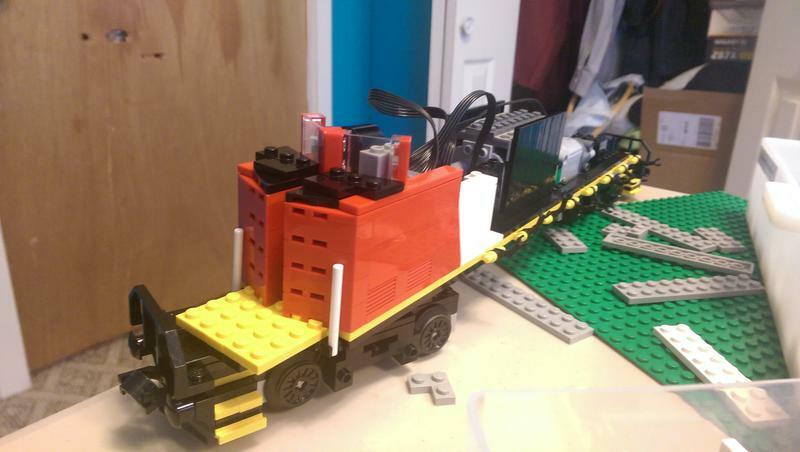 To me it seems like the biggest issue is that you've had to mount the battery box vertically, and therefore can't keep the body to be 6 studs tall - I don't know what's holding up the cab, but is there no way to move the motors further towards the ends? Otherwise concerning the extension and the polarity switch - in practice there's probably no reason to do this because you've have couplers on the ends of the bogies, so you'll always know which way they are supposed to face. 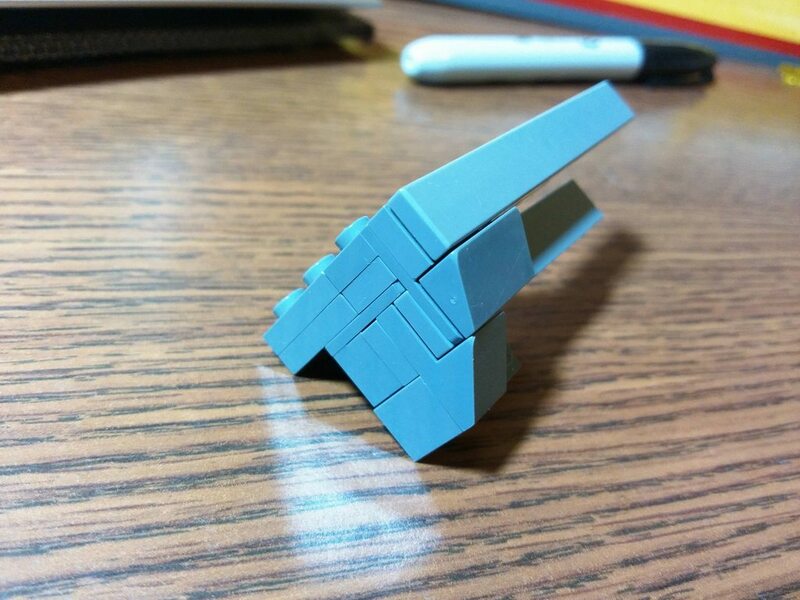 If somehow you won't have couplers on the bogies, you can also build them to be rotationally symmetric, in which case it doesn't matter which way they are pointing too. Not sure why you consider this failed. Just looks like a prototype to me. You should see how some of my locos look before they're finished.... The rear motor can be mounted vertically and the battery box needs to be as low as possible without dragging on the track. It'll fit either horizontal or vertical, depending on how you build. Additionally, there's no need for the polarity switch. 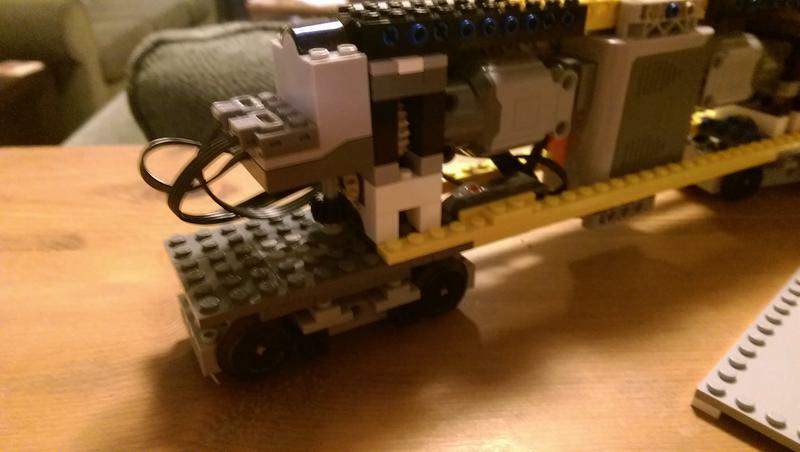 Just change the gearing in the bogie by moving the gears to the other side of the axle. As Commander Wolf said, the couplers will designate which end of the bogie is the leading or tailing edge. I should probably clarify: the polarity switch acts as an extension lead because the motor on the far end is just a few studs too far away to plug in directly. The switch is a bonus resulting from that. Already it's better; rather than transition from 6-wide to 7-wide after moving from the wheelset to the frame, I am transitioning at the interface between the two. The axle connecting the motor to the wheelset is only a 4L, with the only gears being in the truck itself! Yeah, this is how I've done it in all my previous locos. I put all those other gear stages in the U30 so I could change the gearing, but it's excess rather than necessity. With the vertical mounting I'd suggest using Ms because they are a stud shorter. I'll adjust the proportions afterwards, but what I need to do is mount the battery box in the frame in such a way that all I have to do is slap some tiles over the sides, keeping the body 5-wide. 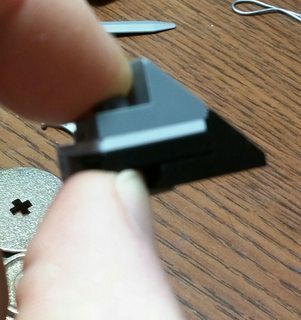 I can utilize the fact that the frame was built in two sections by building a sort of slot out of the frame with 1x(whatever) plates, giving the battery box room to slide through, but I'm not entirely sure how to connect the battery box to the frame and still allow a way to cover up the sides of the battery box. Obviously, I'll cover up whatever is dangling below the frame with the fuel tank, but it's more about the body above the frame that's giving me trouble. 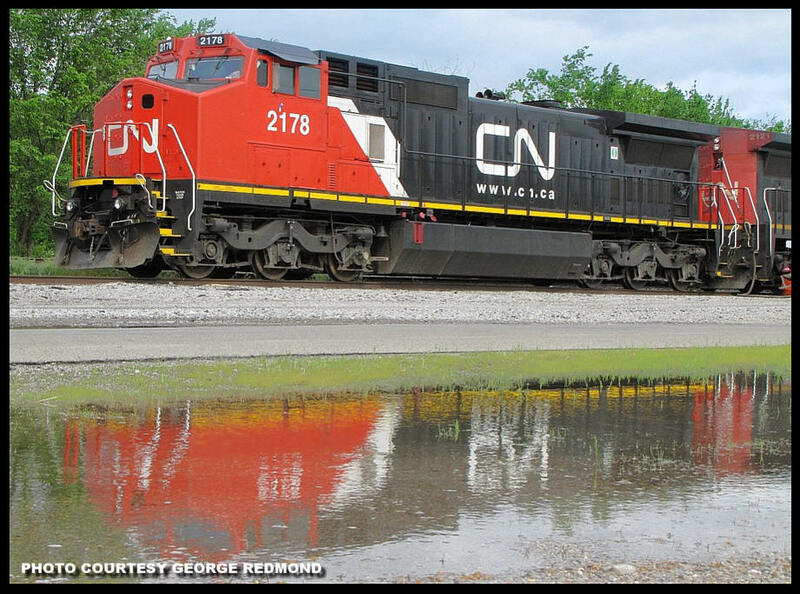 I'm trying to do a Canadian National color scheme, which involves a large white line passing between the black and the red at an angle, similar to the side of the Maersk train. 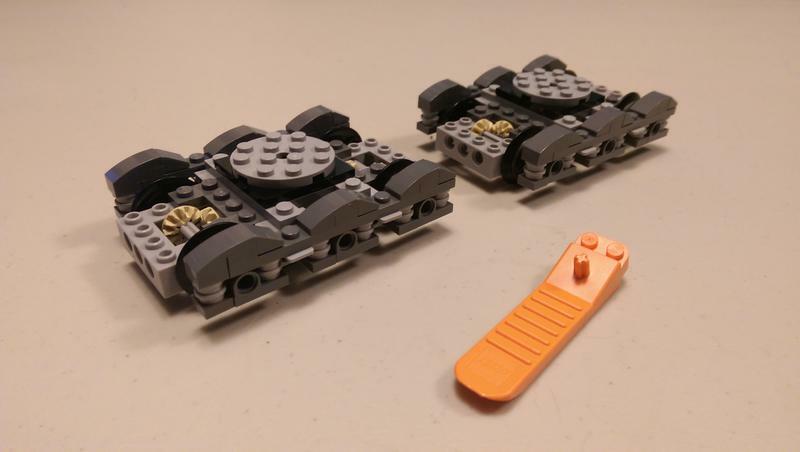 I don't have the ability to make stickers like that, and the SNOTed 1x4 wing plates look off. I do have 1x2x3 slopes in white, but I don't have them in red, or their reverses in white that would enable me to do this in a simple manner. Any thoughts on how to brick-build that in? 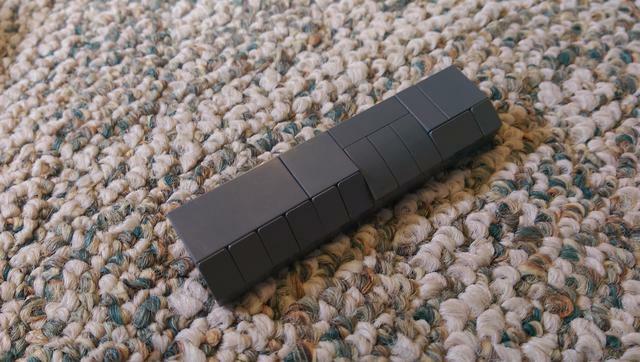 Mount tiles vertically on some http://www.bricklink.com/catalogItem.asp?P=99780 put the brackets as low as you can and the battery box can rest on them. 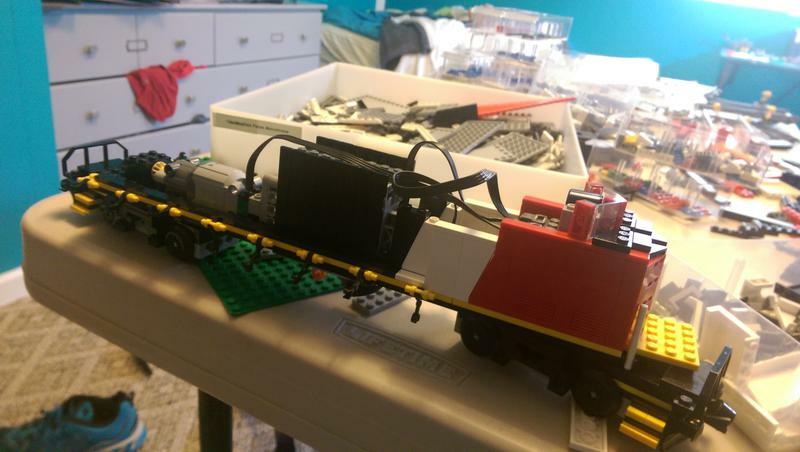 Coincidentally I made the same locomotive in the same color scheme: http://www.eurobricks.com/forum/index.php?showtopic=100590 If I had a digital model of it, I'd share. I'll have to tackle this tomorrow, as I can't just be lazy and stack it on top of the frame without any supports - it falls through otherwise. I do feel smart for having realized that building the base in this manner, rather than using a 2x4 and the brackets, leads to something that's just the right size rather than being a bit too big! Maybe lengthening the base and using more brackets to hook into the frame elsewhere is the way to go, but right now I'm too tired to want to figure that out. Nice to see your process of building and rebuilding. 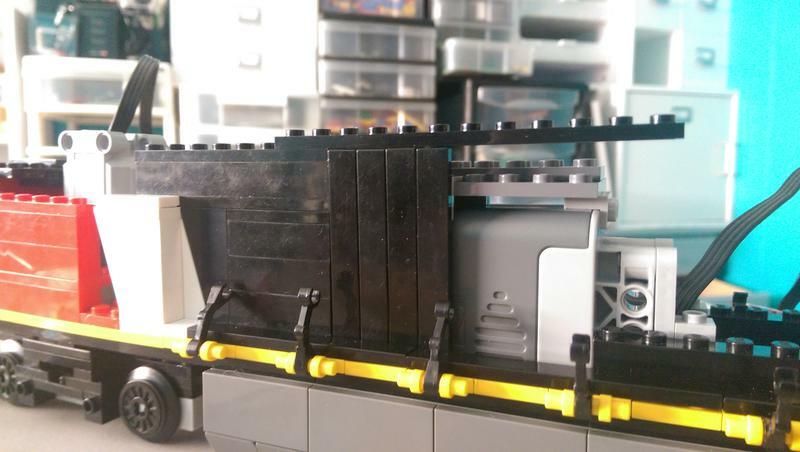 If you let the battery box be a part of the structure (like a beam in itself), letting the plates on the sides be removable for easy battery change, this will let you use less plates/brackets etc. 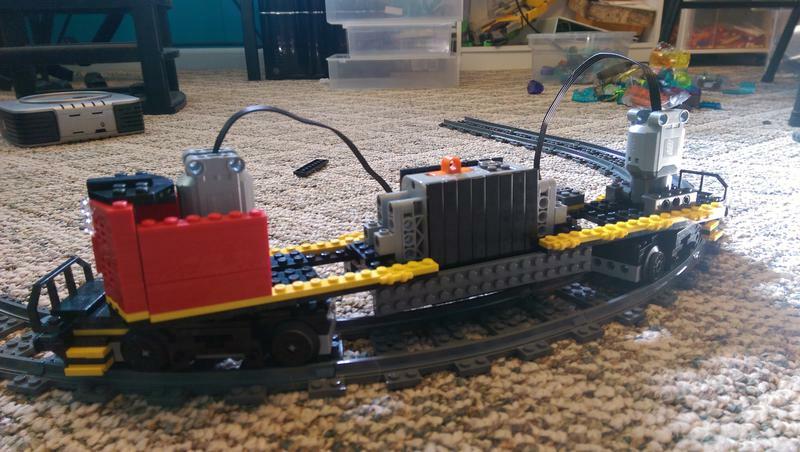 to connect the two ends of your train. When I said tomorrow, I really meant Friday, because normal people tend to frown upon having to listen to the wonderful sound of pieces being shuffled around constantly while trying to study, and as such the Lego lives on a different side of town that I do. 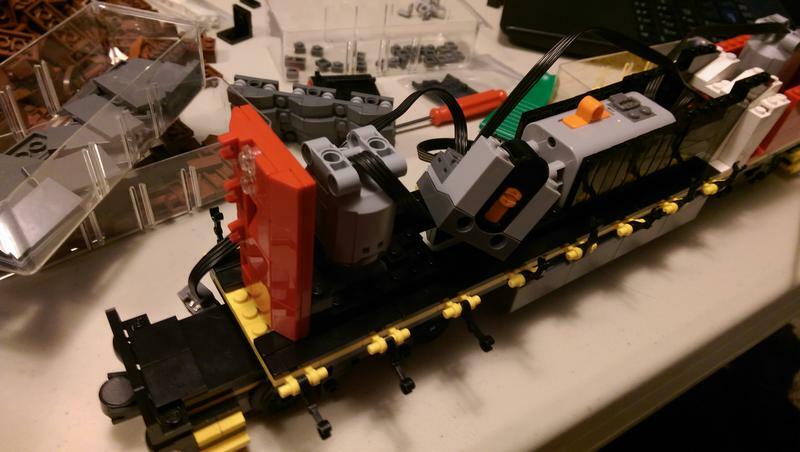 I'm using 1x1 Technic bricks as the main attachments for the battery box; they're spaced out by 1/2 a stud via half-width 5L beams and the 1.5L Technic pins. The whole assembly sits on top of the frame. 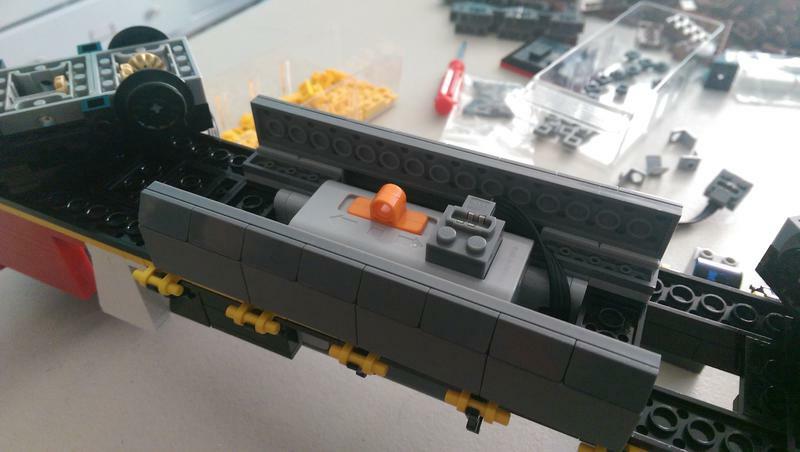 The tiles that act as the paneling that hides the battery box are attached via the method shown in my previous post, and that assembly connects to underneath the brackets that the fuel tank will be built on. 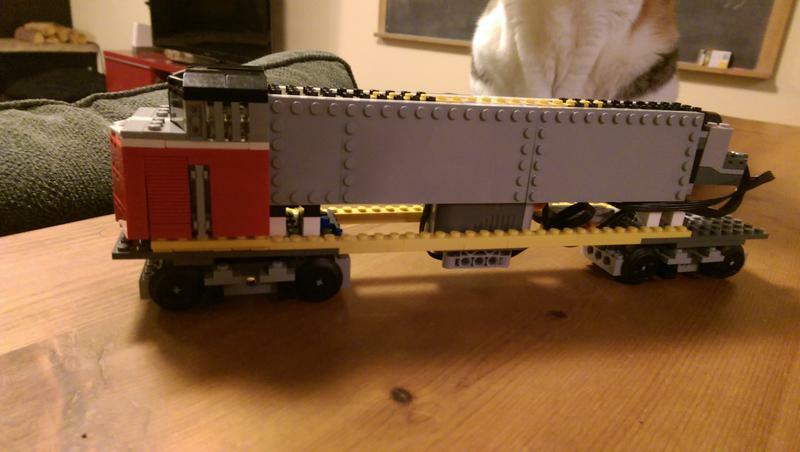 The front half of the frame is constructed primarily of 2x16 plates; given that this leads to a weird gap that I have no use for, I feel like it'll keep things proportional if I replace them with 2x14 plates, keeping the front and back half of the locomotive the same length. Unfortunately, I'm already using my only two 2x14 plates in black in the *back* half of the frame. 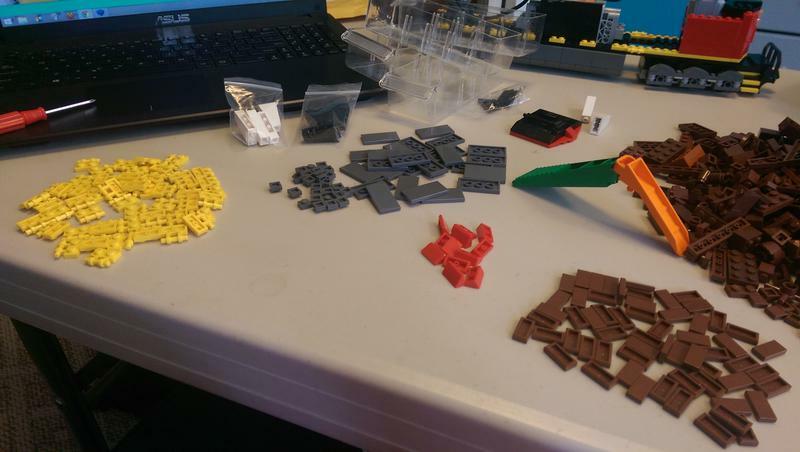 I've started compiling a list for a Bricklink order, which will be my first, so that I can continue this build. Eliminating the extra two studs from the front end will help keep things from sagging (I already tried an underwire, it just didn't fit right) and stiffen up the frame as a whole. At this point the mechanics and sizing look to be appropriate, so I'll move on to the hard part: bodywork. Since this is at least loosely based on the Canadian National color scheme, I'll be brick-building an angled white stripe down the side. While legoman666 built his at the correct 45 degree angle that's present on the prototype, I'll be using the 75 degree 1x2x3 slopes in red and white to keep the edges clean. 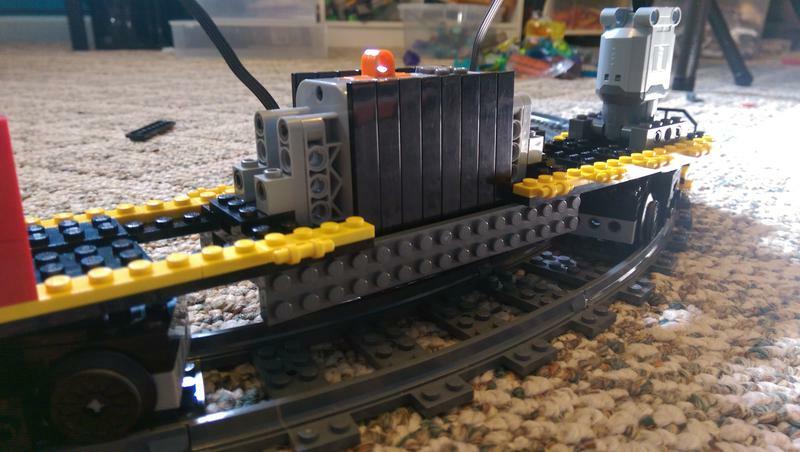 I'll also take some liberties with the fuel tank, and build it in dark blue-gray like the decoration on the trucks to break up the black, as well as incorporate an extra white stripe along the top in order to add some more color to a fairly boring section of the locomotive. I'm also debating whether or not to use yellow 'robot arms' as the railing's vertical supports or the traditional black ones (I suspect this will come down to price). 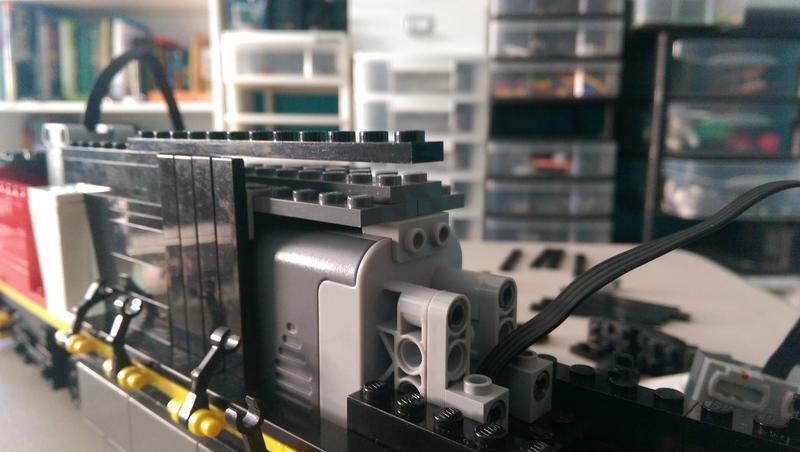 I had thought about suggesting using technic bricks to make the battery box a part of the frame, much like you ended up doing, but I found myself wondering "but how on earth will he change the batteries without tearing the thing asunder?". But it almost looks like your side panels can come off easily so you might have that solved already! I don't envy anyone trying to hide a AA box- I pretty much just stick to the Rechargeable one now. It's spendy, but it caters well to my laziness. 45 degree slope with no jaggedness. Probably more trouble than it's worth. Agree; as far as I know, there's no corresponding inverse slope, or at least one that can be manipulated to created an inverse slope without jaggedness either. Given that I'm playing with the color scheme anyway, I think having the sloped white stripe at a different angle will be fine. Time for an update on this Good Friday. 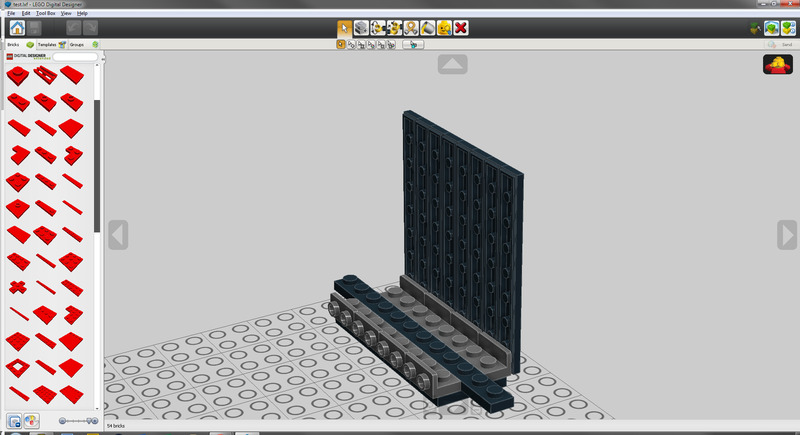 Currently the frame is composed - lengthwise - of two 2x16 plates and a 1x8 plate for a total of forty studs. 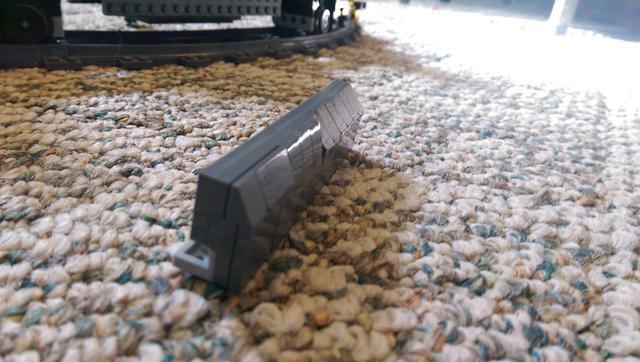 Add to that the ~5-6 studs extra that each wheelset provides and I end up with a total length of ~50-52 studs (I'm lazy and far too comfortable sitting here to get up and verify, but whatever). I'm pretty sure that's within scale for a traditional North American locomotive built in 7-wide, but I'd like some confirmation on that. Either way, it makes the Maersk look small, and the BNSF and my Retro-Futuristic Style Locomotive look silly in comparison. Secondly, I'm at a bit of an impasse over how I ought to build the fuel tank. It'll take up the position currently occupied by the dark blue-gray 2x16 plate in the image below. If we look at the image that I posted earlier in this thread, you'll see how the fuel tank on the original looks. Here I have a small test build that has the three different ways I've looked at how to build the fuel tank. 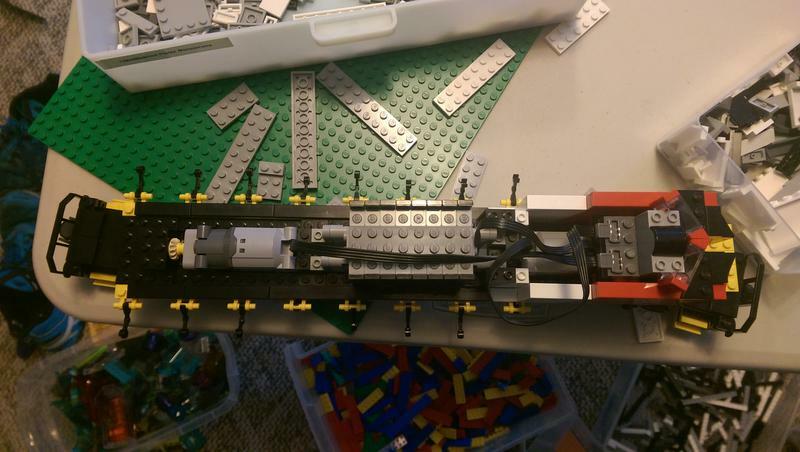 In the first image, from left to right, I'm using part #92946, part #11477, and cheese slopes to get the shape of the fuel tank. There's pros and cons to all three methods. Using #92946 gives me a more aggressive slope, but I have to true them up in the back with a long plate to keep them from going crooked. Part #11477 is pretty much the same, but without the slope and I lose the two-wide tile space. Cheese slopes are the most accessible option as I don't think I would have to get more of them right now, and the whole assembly can be made a bit thinner, but the slope isn't as steep or noticeable. Currently I think the cheese is the best option, without having to buy parts and still maintain the angular look. Thoughts? Any more progress on this model is going to have to be halted until I make a Bricklink order to get some more pieces that I'll need. 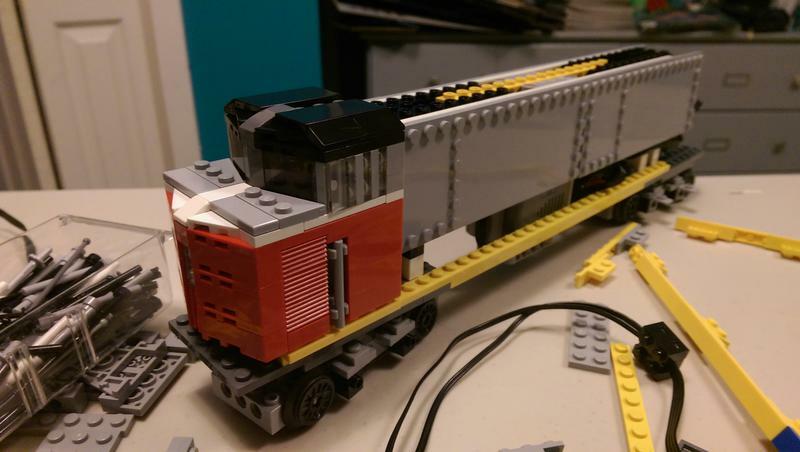 I need to raise the nose from its current height (for the red section) from 4 bricks and one plate tall to a nice round 5 bricks tall, and get the large slopes I need for the stripe along the side to really make noticeable, update-worthy progress. I also need to update the digital version to the current state of completion. Finally; I feel as if this thread has outgrown its original purpose and that this model deserves its own WIP, as my posts tend to be lengthy and riddled full of images. I suspect I know what the answer is, but recommendations on this would be useful.
? Lookin' good. 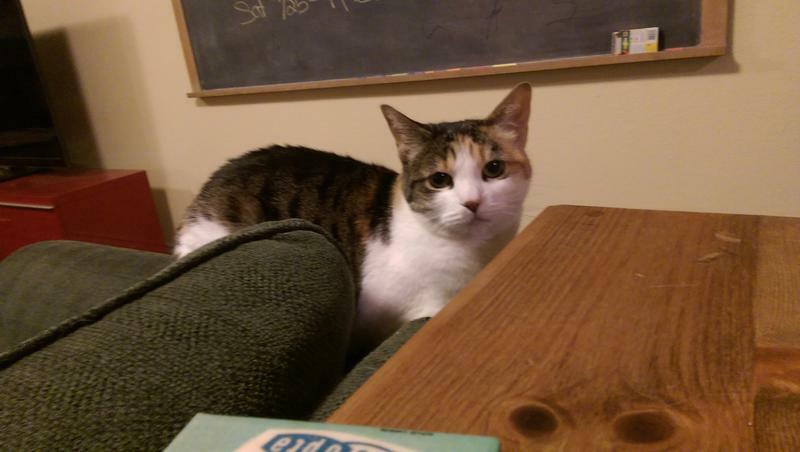 As for the thread, you could just ask a mod to change to the title. Parts arrived from my Bricklink order. It went very well for the first order I made on Bricklink. The brown tiles aren't going to be used in this model specifically, but they'll be going on the outside edges of the track pieces that I've already added 1x4 brown tiles to in order to finish the effect. I started building up the bodywork in order to get a better idea of what my next moves will be. I think I'm going to be building up the bodywork with entirely basic bricks to get the shape right, then strategically disassemble it and add texture as a second step. I think from here it's a straight shot to the end - the only complex parts after this stage is completing the windscreen, inserting the IR receiver into the wide vents at the back, and dealing with how the PF connector wants to attach to the battery box. Since the cable wants to head straight out from the connector, it runs almost directly into the space where the pieces that would go across the top of the battery box would go, and I can't necessarily bend the cable so sharply without damaging it. I'll have to be clever with more sideways tiles to give it space to bend properly. Since the cable wants to head straight out from the connector, it runs almost directly into the space where the pieces that would go across the top of the battery box would go, and I can't necessarily bend the cable so sharply without damaging it. I'll have to be clever with more sideways tiles to give it space to bend properly. You should mount the battery box with the switch down, and then you can hide the cable lead in the big volume of the fuel tank. That's how I've got it on all my locos. Lookin good. Working around wires is always a pain. They somehow are always in the way and seem to be magnetically drawn to small loose pieces on the table and then fling then to the floor. Making my last 2 units without PF was very satisfying. FYI, 1x2 brown tiles are generally cheaper on the online pick a brick than bricklink in any decent quantity. Just wait for double VIP points to order. The 1x4 tiles have been on pick a brick walls in store, and so you can get several hundred in a cup for only $15. That, and for whatever reason, they don't want to stick to this battery box. I actually got all of my 791 reddish brown 1x4 tiles off the PAB wall! As for the tiles, I got 60 of them at ~8 cents apiece piggybacked on this order. It's been recommended to me by my LUG that if the store I order from has parts I'll need later at reasonable prices, I get at least some (if not all) of those parts and slowly build up my collection of them that way. I'm not attaching them to the bottom anymore, as you can see! I've attached them to the top with a bracket that's pretty much the reverse of the previous, except it's a 4-wide setup. The whole bracket floats on top of the battery box. 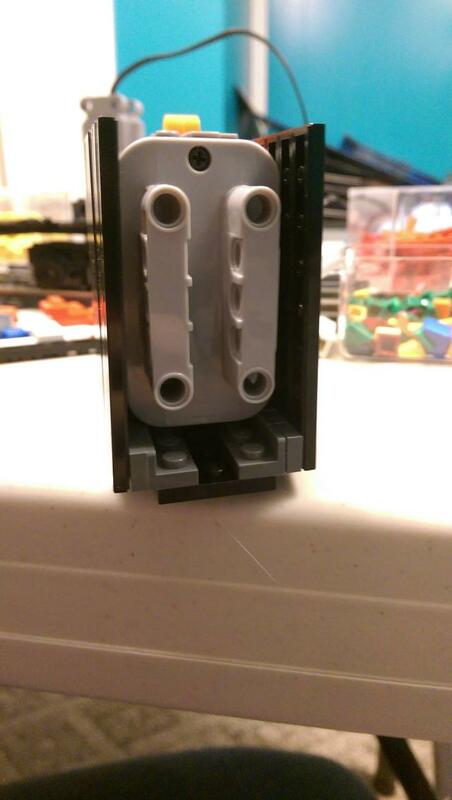 There's a second inverted bracket on the other end, which locks the bracket from sliding back and forth. 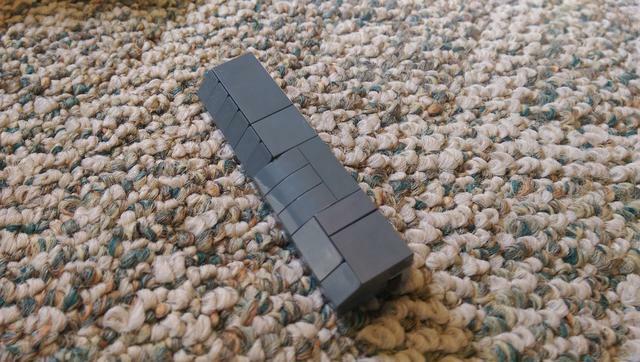 I'm using minifigure neck brackets to hold the tiles vertically, which keeps them in line with the rest of the body - if I use standard bracket pieces, the thickness of the vertical piece puts the tiles slightly outside the width of the space they fit through in the frame below, causing them to bulge out at the top. This way they're nearly completely flat with the rest of the bodywork. The picture above this one shows how well the tiles align vertically with this setup: pretty much perfectly! Excuse the mess, I was in a bit of a hurry. Most noticeable is that the motors are now mounted sideways - it'll be a little while before I'm able to test if the new mounting system keeps everything locked in place, but it seems to be doing alright so far. I'll probably tie it into the bodywork. Also, I can now hide the IR receiver inside the cabin and not have to worry about trying to hide another 4-wide element in a 5-wide body! With finals week being next week, at least soon I'll be able to work on this project more than once or twice a week. I hope to get it finished before the month is out but we'll see how that goes.